Welcome to "This is America" in VOA Special English. I'm Steve Ember. And I'm Shirley Griffith. This week on our program, we find out how some people will be welcoming a new year. New Year's – New Year's eve? El día de Fin de Año. So what do Americans do in New Year's Eve? Hillary Huesman is from South Carolina. "I get dressed up. I look to go out. I'm usually single, and that is usually not a problem. This year I'm still making my plans. I haven't quite confirmed them yet, but probably a hotel ballroom-type scenario, black-tie event." At a black-tie event, the men dress in tuxedos or dark suits and the women wear fancy dresses. 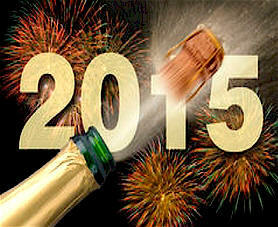 Hotels in many cities have special deals for New Year's Eve: dinner, champagne and the party. Then people get a room for the night. That way, no one has to worry about drinking and driving home. On New Year's Eve, some communities in the United States hold what are called First Night celebrations. These are events where no alcohol is served. The celebrations include things like music performances, art displays and fireworks. Boston, Massachusetts, held the first First Night celebration in 1976. Since then the idea has spread internationally. Some people might not have firm plans yet for New Year's Eve, but others know exactly what they will be doing. Joe is a twenty-one year old student at the University of Virginia. "I don't really do a whole lot. I normally just spend time with family, go out to eat, hang out, wait for the ball to drop on TV." Joe is talking about America's best known celebration on New Year's Eve. Hundreds of thousands of people crowd into Times Square in New York. They count down the final seconds to midnight as they watch a brightly lit ball slide down a pole on top of a tall building. The first New Year's Eve ball drop in Times Square took place more than a century ago. The ball was made of iron and wood and it was lit with one hundred lights. Today the ball is larger and covered in more than two thousand crystals. Two other traditions for welcoming the New Year are a midnight kiss and an attempt to sing a song that almost no one knows. "Auld Lang Syne," by the eighteenth century Scottish poet Robert Burns, is a song about friends and remembering times long ago. In days of auld lang syne? A new year is a good time to start fresh – and, for some people, a time to seek good fortune in the year ahead. In the American South, for example, people might prepare a dish known as "Hoppin' John." They make it with black-eyed peas and ingredients like bacon, rice and vegetables. Eating it at the New Year is thought to bring good luck. On New Year's Day, some families in the United States invite friends and relatives to an open house. Jill Cooper from Santa Fe, New Mexico, gave us a description. "They're family parties, big open house-y kind of parties with lots of cookies -- too many cookies --and punch and eggnog. And houses are decorated, and you see your friends and you bop from party to party." But that is not all she and her family like to do to celebrate the New Year. "We try to do something outside 'cause we live in Santa Fe and we live right in the mountains. Everybody wants to go for a wonderful hike and start off with fresh air and all the things we're going to have in our lives the whole next year. And then we drop in on parties." Some families like to take it easy on January first and enjoy a quiet day of rest. Twenty year old Malia is from Virginia. "I usually sleep in because we stay up late on New Year's Eve. And my family, we usually eat the leftovers of the desserts that we make for New Year's, or New Year's Eve and stuff, so. But, just relax, mainly." But New Year's Day is anything but a day of rest for John Worster, who lives in Idaho. "I offer Catholic Mass, 'cause I'm a Catholic priest by profession, and so it is actually the feast day of Mary, Mother of God. And so we begin our Catholic way of understanding new year by just thanking God for Jesus' mother, Mary. On New Year's Day, after church we'll go out and sit in the goose pit and do some hunting for Canada geese and also ducks." On New Year's morning, millions of television viewers watch the Tournament of Roses Parade in Pasadena, California. The parade includes marching bands and horseback riders. But the parade is most famous for its motorized floats. They come in all shapes and sizes, but they are all covered with flowers. In Southern California, the weather on New Year's Day might be cold. But the skies are usually sunny and dry, even as other parts of the country might experience snowstorms. A local group created the Tournament of Roses festival in Pasadena in 1890. The festival later expanded to include the parade and a big game in college football. I'm Shirley Griffith. And I'm Steve Ember. We wish you all happiness and good fortune in the New Year, and hope will join us again next time for "This is America" in VOA Special English.